This thaniyan of thiruppallAndu talks about the greatness of srI periyAzhwAr and offers namaskAram to srI periyAzhwAr. narapathiparikluptham sulkam AdhAthukAma: – such great AzhwAr went to srI vallabhadhEvan, pANdiya king on srI vatapathrasAyi’s Orders to establish sriman nArAyaNan’s parathvam (supremacy) and win the prize in the sathas (assembly). prAha vEdhAN asEshAN – As, pIthagavAdaip pirAnAr thAmE piramaguruvAy [periyAzhwAr thirumozhi 5-2-8] (emperumAn himself came as AchAryA and taught everything), to periyAzhwAr; periyAzhwAr knew entire vEdham, which is difficult to learn even for great rishis. This happened due to emperumAn’s blessing of mayarvaRa mathinalam [thiruvAimozhi 1-1-1] (blemishless knowledge) to AzhwAr. svasuram amaravandhyam ranganAthasya sAkshAth – After that periyAzhwAr was involved in pushpa kainkaryam and found srI ANdAL from nandhavanam (garden) and by giving srI ANdAL to srI ranganAthan, periyAzhwAr became father-in-law for sri ranganAthan. patta nAthar is father-in-law for maRai nAngum mun Odhiya pattan (one who first taught the 4 vEdhams – thirumozhi 7-3-6). dhvijakulathilakam – As explained in “vEyar thangaL kulaththu uthiththa vittu chiththar [periyAzhwAr thirumozhi 5-4-11]“, srI periyAzhwAr is the leader of the brAhmaNa kulam. tham vishNuchiththam – one who always thinks about srI vishNu (or having srI vishNu in his thoughts). Many pAsurams are cited highlighting his name – villipuththUr vittu chiththan virumbiya sol thiruppallANdu 12], minnu nUl vittu chiththan viriththa [periyAzhwAr thirumozhi 1-1-10], vituchiththan manaththE koyil konNda kOvalanai [periyAzhwAr thirumozhi 5-4-11]. tham vishNuchiththam namAmi – I pray to such periyAzhwAr. minnAr thadamathiLchUzh – the mathiL (compound wall) is such that, emperumAn’s adiyArs (devotees) are able to enter and others not able to do so; this mathiL is in periyAzhwAr’s town, who is mangaLAsAsanaparar (always seeking out the well-being of perumAL)! 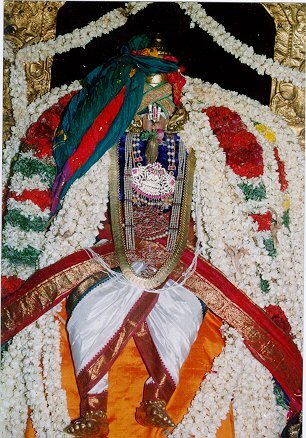 villipuththUr – srIvillipuththUr is like praNavam due to villipuththUruRaivAn (vatapathrasAyi perumAL – akAram), villipuththUrp pattarppirAn (AzhwAr – makAram) & annavayal pudhuvai ANdAL’s (thAyAr – ukAram) presence. munnAL kizhiyaRuththAn enRuraiththOm – bhagavath gIthA 4.9 “jaNma karma cha mE dhivyam….” Similar to thinking of krishNa’s birth and his deeds would destroy our deeds, thinking of srI periyAzhwAr’s birth and deeds will also stop our birth in this samsAram. periyAzhwAr’s birth place – srIvillipuththUr and periyAzhwAr’s karmam (deed) – winning the kizhi (price money). kIzhmayiniR chErum vazhiyaRuththOm – We prevented entering all other mArgams (ways) other than archchirAdhi. vENdiya vEdhangaLOthi virainthu kizhiyaRuththAn – periyAzhwAr explained that the vedhams utter about the ways to perform ArAdhanam (worship) and also the vasthu (object of that worship) to whom such ArAdhanams should be performed (sriman nArAyaNan is the supreme lord). And after doing so the prize money set for the sadhas (assembly/competition) itself came down to periyAzhwAr’s hands. pAthangaL yAmudaiya paRRu – the lotus feet mentioned here is not “thagaiyAn charanNam thamarkatkOr paRRu [thiruvAimozhi 10-4-10]”; rather it is the lotus feet of periyAzhwAr who sung pallAndu that serves as protection to emperumAn himself; this feet is protection for us too, who are un-protected, paRRilAr paRRa ninRAn [thiruvAimozhi 7-2-7] (one who is the refuge for the ones who are not attached to anything else). This entry was posted in mudhalAyiram, thiruppallANdu on June 6, 2015 by sutharsan srinivasan.